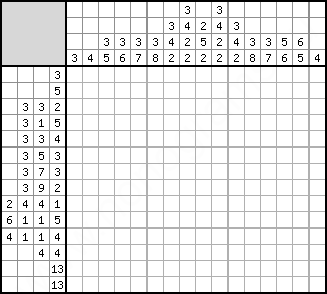 A Japanese crossword – is a puzzle, which has a picture encoded in numbers. The aim of the puzzle is to restore this picture in full. 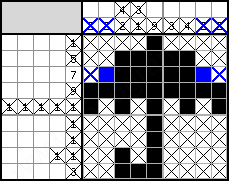 Japanese crosswords can be of two types – black and white and colour. In black and white crosswords the picture contains only two colours – black (we paint using this colour) and white (background colour). In colour crosswords the picture is reproduced by several colours against white background. A field of a Japanese crossword is lined both horizontally and vertically with lines of different thickness. The thickest lines separate the central part (field of the picture) from numbers. With the help of thinner lines the field is divided into groups of 5 squares (both horizontally and vertically) – it is made only for convenience (it is more convenient to count width/height of the groups of squares. 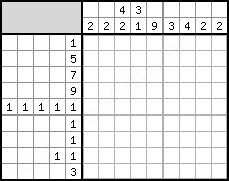 The picture itself in a Japanese crossword is formed by painting separate squares (central part) using necessary colour. While an unpainted square is supposed to be white. 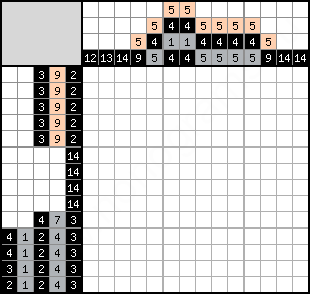 Numbers, shown on the left and above the crossword – describe the groups of painted squares (which go in sequence, no blanks) horizontally and vertically accordingly. The order of these numbers describes the order of location of these groups, but it is unknown where each group starts and finishes (in fact it is the task of the puzzle to define their location). Each separate number means a separate group of the given size (i.e. number 5 – means a group of five painted squares in sequence, 1 – a group of only one painted square). In black and white crosswords we always paint the square black, in colour ones – we paint the square using the colour by which the number is marked. Between the groups of one colour there should be at least one unpainted square (otherwise they would make one group). Between groups of different colour there can be no empty squares. Note The main requirement to Japanese crosswords is that the crossword should have only one logical solution, achieved without any “guessing” (method of trial and error). 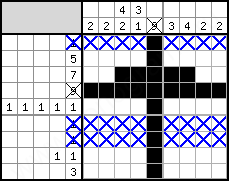 But unfortunately it is quite often possible to find crosswords with several variants of solution, or crosswords which can’t be solved by purely analytical methods. Sometimes there are even crosswords with mistakes (or more exactly misprints) which make the crossword unsolvable at all. By this reason we recommend beginners not to pay attention to cheap newspapers/magazines with Japanese crosswords and to treat Japanese crosswords in newspapers not specializing on this very kind of crosswords cautiously, as you may often find mistakes in such issues. Also we would like to note that we guarantee our crosswords, that all of them have no mistakes and have only one solution achieved without any “guessing”. Solution of colour crosswords is a bit different from solution of black and white ones (as in black and white crosswords you don’t need to take into account the colour of the squares, the rules are a bit simpler) – that’s why so far we will talk only about black and white crosswords. To define the squares which are sure to be painted (with any possible location of the groups) – so we paint them. To define the squares in which it is impossible to have painted squares – such squares are marked with a cross (sometimes a bullet point is used instead of a cross). To define the numbers, which location is already identified – usually these numbers are crossed out. 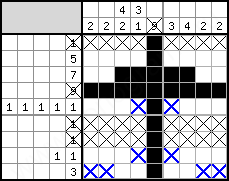 Thus, gradually there are marks in the field which help to identify new marks step by step, then more and more marks until finally the crossword is completely solved (it should be noted that if even only one mark is put incorrectly – it may lead to a deadlock solution). 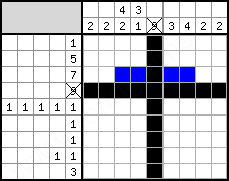 In front of us there is a simplest crossword of the size 9x9 squares. We will gradually decipher this crossword explaining every step. For you not to get confused, we will point out the new marks by blue colour. First of all we shall look if there are lines in the crossword which should be completely painted. It turns out there are such ones – in our case it is number 9 in the fourth line. As the width of the crossword is just 9 squares – so all the squares in this line should be painted. Also we cross out the number 9, so that it wouldn’t distract us. Similarly we shall look for the columns which should be completely painted. Let’s have a look at the third line. We should remember a little rule, which will help us a lot – if there is only one number near the line or the column and it covers more than half of its length, you can paint several squares in the middle. In our case they are central five squares. Why? 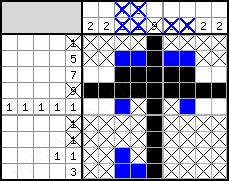 No matter how you may place a group of seven squares in nine squares, five central squares are sure to be painted (to count it, you can subtract value of the number from the width of the crossword – you will get number 2, which means the amount of “unknown” squares on the left and on the right, so we paint the rest central five squares)..
Now we can mark with crosses (or points) the squares which are sure to be left unpainted. Have a look at the first line – it is completely solved, because we already have one painted square and it should contain no more painted squares. It means that we can mark all the rest squares with crosses. We do the same in the sixth and seventh line. Don’t forget to cross out the numbers in the solved rows. In the fifth line we have one painted square and as this square can contain nothing else but single squares, we can mark with crosses the squares on the left/right from the deciphered one. We cannot cross out the numbers because though we have deciphered one number, we don’t know exactly which one. There is a similar situation in the eighth line. Also in the ninth line we can say for sure that the first two squares and the last two squares are sure to be left unpainted. Why? It is just because we have already deciphered one square in this line and the only number in this line – three, should be a part of this painted square. Now have a look at the first column – like at a previous step we have only one number in this column – two, and one deciphered square. Accordingly, the first two and the last four squares are sure to be left unpainted. A similar situation is in the second and the last four columns. It can be noted that in the central five columns there are very few empty squares left, even more than that – their number exactly coincides with the numbers shown above. Therefore, all these squares can be painted. Shifting to the lines, we can see that the second and the last two lines are already solved. 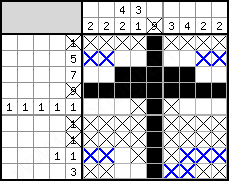 And in the fifth line we can put crosses on the left and on the right of the deciphered squares, as this line contains nothing but single squares. Shifting to the columns, we see that the first and the last columns are already solved. The only thing left to us is to paint the last squares in the second and the eighth columns and… Congratulations! The crossword is completely solved! 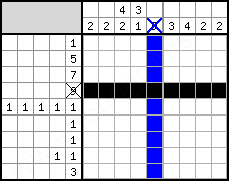 Now we strongly recommend You to solve this crossword once more, but this time independently: switch to the crossword. Have you made it? Great! Then we recommend you to solve the crosswords in the following order: switch to the list of crosswords. We only wish You to have success and a pleasant game!